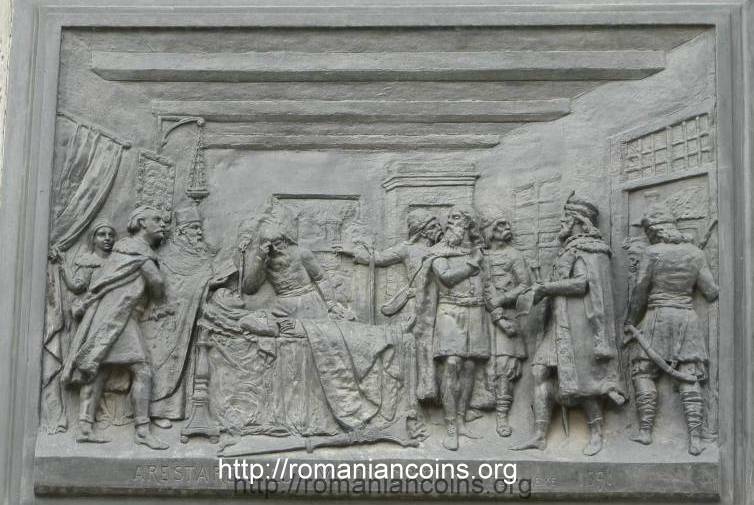 The coin was struck at the Romanian State Mint, having a mintage of 500 pieces. 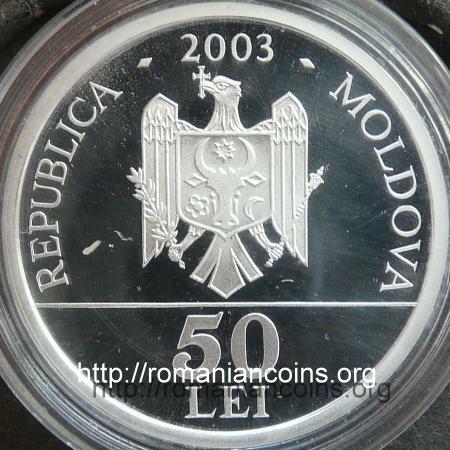 The pictures of this coin are present on Romanian coins through the special kindness of an anonymous donor. Miron was son of Iancu Costin (?-1650), a Moldavian boyar. The father of the chronicler appears many times as character in Miron's chronicle. So, we learn that postelnic Costin was the one who, in July 1633, buried at the Patriarchy of Constantinople the body of the elected ruler of Moldavia, Miron Barnovschi (1626-1629, 1633), killed by the Turks. In 1634 the throne of Moldavia was occupied by Vasile Lupu (1634-1653), and Iancu Costin - at that time hetman - "passed to the Polish Country", together with voivod Moise Movilă (1630-1631, 1633-1634). 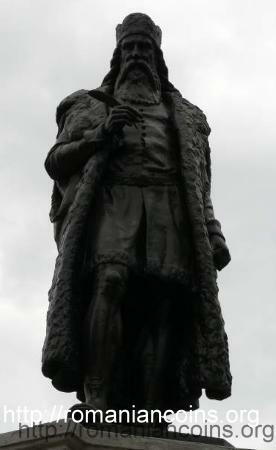 In Poland hatman Costin received the indigenate, thus becoming Polish nobleman. Miron studied at the Jesuitic College of Bar. In 1651 he took part to the great battle of Berestechko (nowadays in Ukraine), in which the Polish army defeated the Cossack army of hetman Bohdan Khmelnytsky (~1595-1657) and the army of the Crimean Tatars, at the time allied with the rebel Zaporozhian Cossaks . 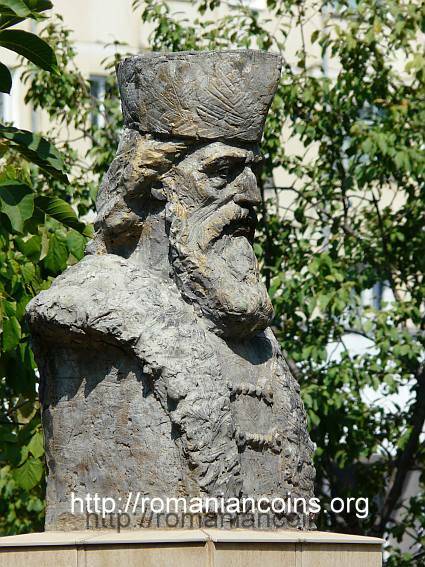 In 1653 Miron was in Moldova, where he served at "Iordachie the great vistiernic" (treasurer). In 1653 the great logothete Gheorghe Ştefan rose against Vasile Lupu with the help of some Transylvanian and Walachian armies, having consequently managed to occupy the throne of Moldavia (1653-1658). When Vasile Lupu ran away, young Miron transported "the heart of the earnings" of Iordache Cantacuzino over the border, into the Polish fortress of Cameniţa. Having changed side to the new ruler, Miron translated during the meetings of Polish and Transylvanian army commanders with Gheorghe Ştefan, occasioned by the siege of Suceava fortress, where the family and wealth of Vasile Lupu was stationed. In the following years Miron occupied more and more important positions - the chronicler himself testified that from Gheorghe Ştefan he had "a lot of pity". 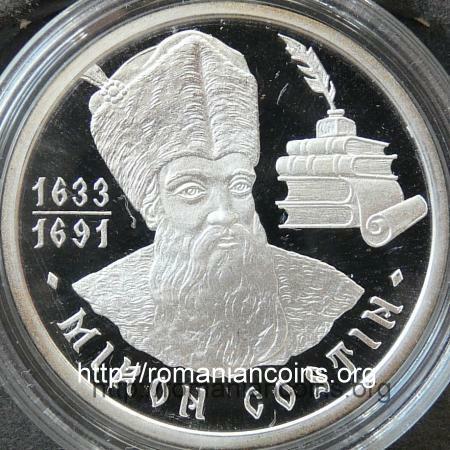 Miron Costin continued the political career, becoming great vornic (overseer) of the Lower Country and great logothete. Among others, he participated to the siege of Vienna in 1683. As a curiosity, we remark that the great chronicler Grigore Ureche was also great vornic of the Lower Country (Ţara de Jos). 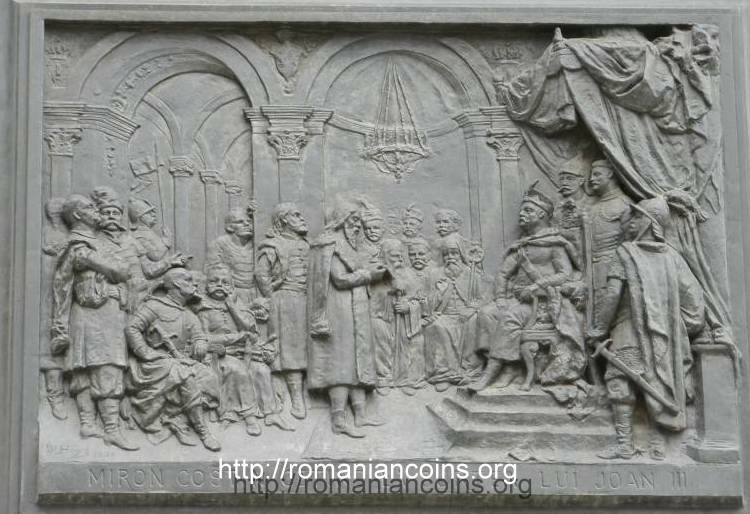 During the reign of Constantin Cantemir (1685-1693), the chronicler returns from Poland to Moldavia, and is appointed staroste (ealdorman) of Putna (county in the southern part of the country, including the Moldavian city of Focşani and the city of Adjud); his brother, Velicico, was appointed hetman. In 1691 prince Cantemir found out about a plot against him, to which Velicico the vornic participated. The brother of Miron is beaten by the prince with the mace, that his head was cut off. Chronicler Ion Neculce told the following events: "And then found the unfriends time to say to Cantemir-voivod: <<Now, since you killed Velicico, send and catch also his brother, Miron the logothete, and have him killed. Either guilty, or not guilty, do not let him escape, as afterwards it will be worse for you and us>>.” Macrei, the head of păhărnicei (small aulic rank of boyars who filled the glasses at prince's meals), took Miron from his demesne of Bărboşi, and then "ordered to cut him in Roman”. The three sons of Miron were caught and locked up for a while in the princely court in Iaşi. The main work of Miron is the Chronicle, "Moldavia's Land Chronicle from Aaron-voivod Thenceforth, from where Uréche Vornic of Lower Country Left It, Drawn Up by Miron Costinŭ Vornic of Lower Country in the City in Iaşi, in the Year from World's Creation 7183, and from the birth of World Saviour's Birth, of Jesus Christ, 1675 month ... day”. In "About the Kin of the Moldavians, from What Country Did Their Forefathers Come Forth”, unfinished work, the learned Moldavian wanted to clearly show to his contemporaries, argumented, the Latin origin of the Romanian language as well as of the Romanian people in the Romanian principalities ("[...] and that which is old name stands steady and rooted: rumân [Romanian]. As we see that, even if we now call ourselves Moldavians, we do not question: do you speak Moldavian?, yet instead do you speak Romanian?, meaning Rome-anian, little misses to us for saying: sţis romaniţe? on Latin language.”). Costin wrote in Romanian using often the syntax of Latin language , seating the verb at the end of the phrases. As a consequence, sometimes the text is more difficult to follow for the busy modern reader. Miron wrote a chronicle of Moldavia also in Polish, in 1677. In 1684 Miron Costin dedicated and presented to the king of Poland, John Sobieski (1674-1696), a "History in Polish Verses about Moldavia and Walachia” ("Historya polskimi rytmami o Wołoskiey ziemi i Moltanskiey") . Miron Costin left to us also two poems: "Viiaţa lumii” [Life of the World] and "Stihuri împotriva zavistiei” [Verses against Scorn], and a small text about the "meaning of the verses” . To the end of the "Psalter in Verses", published by metropolitan Dosoftei, two poems written by Miron are found. From the great chronicler we got also a few translations, some letters and discourses in Polish. Undisputedly, Miron Costin was one of the greatest personalities of Romanian literature and culture in the 17th century. 2. Costin M., Letopiseţul Ţărîi Moldovei. De neamul moldovenilor. Editura Minerva, Bucureşti, 1976. 3. Costin M., Istorie în versuri polone despre Moldova şi Ţara Românească (1684), ediţie şi traducere de P.P. Panaitescu. Academia Română, Memoriile Secţiunii istorice, seria III, tomun X, mem. 7, Editura CVLTVRA NAŢIONALĂ, Bucureşti, 1929. 4. Costin M., Viiaţa lumii. Editura Porto-Franco, Galaţi, 1991. 5. Neculce I., Letopiseţul Ţării Moldovei (de la Dabija-vodă pînă la a doua domnie a lui Constantin Mavrocordat precedat de O samă de cuvinte). Editura pentru literatură, 1963.